When I arrived at class one day this week, Phumza was waiting to greet me. “I just had to come to tell you all that is happening in my life, : she said. 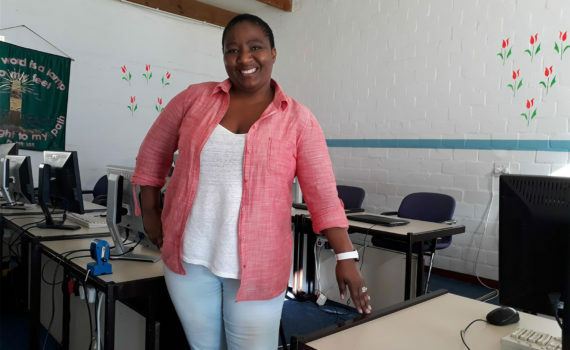 When Phumza finished her semester in July 2015, she could not attend graduation because she had suffered many injuries in a car accident in Durban where she was attending a funeral. She was an outstanding student. Fully recovered, Phumza has a growing cake and food business. and is currently enrolled in a three year program of Hospitality and Business at a local college. She is sewing as wel!. When her daughter needed a track suit for school at an expensive price, Phumza said she purchased the materials and sewed it for one third of the cost. 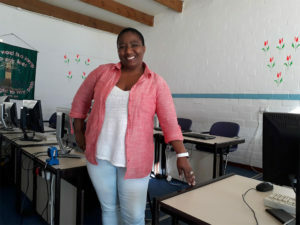 Her dream is to own her catering company, And Phumza said,” it all started here at Evangeline.” She will soon cook lunch for all of the students. “I am so grateful, I just want to give back,” she says.